If you haven't read the book thief yet then don't mind me staring at you as if you are wearing a rainbow coloured tutu with cats ears and flashing blue doc martins with a vampire cape. You look fine. The book thief, is, as you should know, high up on the favourite books I've read since I can't remember when list I have going on up in my head. It's written in a lyrical, beautiful style that you just want to swim in, and of course, the characters. I'm not going to go into that particular subject because I won't be able to control myself - If you've read the book you'd know why. If you haven't read the book but have seen the movie you should know why (but I am judging you) - and if you've not read the book? Well the whole purpose of this post is to get those people to pick it up. So go on. IT IS 1939. NAZI GERMANY. THE COUNTRY IS HOLDING ITS BREATH. DEATH HAS NEVER BEEN BUSIER, AND WILL BECOME BUSIER STILL..
Haha! I love that you wrote an entire blog post just to say "You need to read The Book Thief." If any book is worthy of such a post, it is this one. I'm crossing my fingers that you'll get someone to pick it up! Meanwhile, I need to go read Markus Zusak's other books, which I've been putting off doing in the fear that they won't live up to The Book Thief. Ohh same I haven't read any of his other books either, I'm scared. TELL ME HOW IT GOES. One of my absolute favorites. Currently rereading this right now, actually. It's such a beautiful book! GORGEOUS graphic! I've watched the movie but not read the book. But I really, really want to! I will pick it up soon!! THIS IS SO PRETTY OMG. THE BOOOOOKKKK THIIEEEFFFFFF. I LOVE THIS BOOK AND THAT GRAPHIC IS FREAKISHLY GORGEOUS. I'M SORRY I JUST CANNOT CONTAIN MY FEELS AT THIS MOMENT. FJSAKLFDSFAD BEST BOOK EVER. I love that quoted graphic- how nice is it?! I would definitely consider buying that as a print. That's the thing about The Book Thief: I believe I ended up getting into it because of the beautiful things that were created by people who LOVED it. Like this post. It has an amazing effect. SO MUCH LOVE. TOO MUCH LOVE. AN INCREDIBLE AMOUNT OF LOVE. 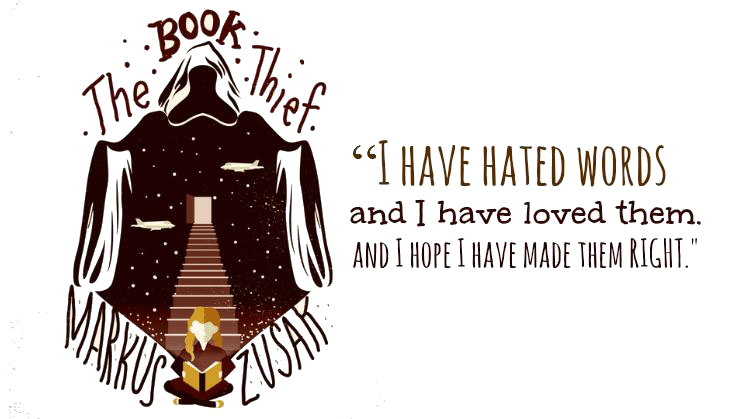 The Book Thief is something I do not post about nearly enough. Also, I need to reread it. Like, now.